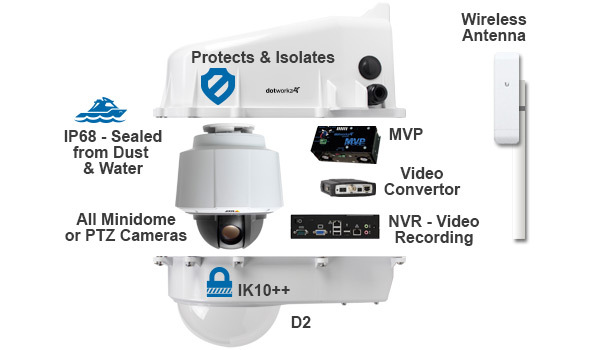 Since 1998 Dotworkz has been manufacturing professional grade climate controlled protection solutions for security, broadcasting, research, and OEM camera systems. Our products give industry professionals a quality engineered solution that is made to withstand and thrive in all environments. Engineered, built, tested, and supported in San Diego, CA to the highest standards and safety certification levels to insure quality and performance while extending the life of cameras and sensitive electronics. Our mission is to produce installation ready network based video solutions for our partners worldwide. The Dotworkz companies aim to promote products that allow video technologies to be deployed in locations that benefit public safety while increasing global communications. Intrinsic excellence – to produce product solutions that are “world class”. Customer Service – our reputation for customer service is our success. Team respect – every person on the Dotworkz team is responsible for our company’s success. Business partners – to develop an ethical community of partners to promote long term business relations for the world market. World community – bettering our world community by ethically utilizing network based video to conserve natural resources, increase public/personal safety, and to provide communication inroads that will benefit future generations. We have a very committed team at Dotworkz. The dedication of our employees in ensuring the satisfaction and loyalty of our customers is the reason that many industry-leading companies have bet their businesses on Dotworkz. Our employees enjoy great opportunities for career advancement. Please email your resume to: careers@dotworkz.com or fax us at: (619) 639-9914. This website (and all sub-domains) (“Website”) is owned and maintained by Dotworkz Inc. (“Dotworkz”). By accessing this Website or any materials or services provided by Dotworkz through this Website, you agree to the terms and provisions of these Terms of Service (“TOS”). If you do not agree to these TOS, do not access or use this Website. If you are accessing this Website on behalf of your employer, you represent that you are authorized to accept these TOS on your employer’s behalf. Dotworkz may change these TOS at any time by posting the revised TOS on this Website and you agree to review these TOS periodically to be aware of such change. Your continued use of this Website after any changes to these TOS are posted will mean you accept such changes. If you do not agree to these TOS or any modified TOS at any time, immediately cease using this Website. Dotworkz reserves the right to modify or discontinue any feature or products available on this Website at any time. Information Except where noted otherwise, all content published via Dotworkz Web Properties is the property of Dotworkz Inc. Copyright 2018 Dotworkz Inc. All rights reserved. Any reproduction or distribution of Dotworkz Web site content without the permission of Dotworkz Inc. is prohibited. Information on the Dotworkz internal Web site may not be copied or distributed without explicit written permission of Dotworkz Inc.
Dotworkz, Inc., www.dotworkz.com, the logo, Cooldome, D2, the respective taglines, logos and trade marks are trademarks of Dotworkz, Inc., which may be registered in certain jurisdictions. All other trademarks are owned by their respective owners. Some or all of the information contained in this Web site may be protected by patents pending application for Dotworkz, Inc. THE INFORMATION AND CONTENT PROVIDED ON THIS WEB SITE ARE PROVIDED “AS IS” WITHOUT WARRANTY OF ANY KIND, EITHER EXPRESS OR IMPLIED, INCLUDING, BUT NOT LIMITED TO, THE IMPLIED WARRANTIES OF MERCHANTABILITY, FITNESS FOR A PARTICULAR PURPOSE, OR NON-INFRINGEMENT. THE CONTENT OF THIS WEB SITE MAY CONTAIN INACCURATE OR TYPOGRAPHICAL ERRORS AND DOTWORKZ MAY MAKE IMPROVEMENTS OR CHANGES TO THE CONTENT AT ANY TIME. For further information regarding Dotworkz trademarks and copyrights, please contact info@dotworkz.com. Dotworkz, inc. considers your privacy important. This policy explains our policies and practices regarding how we use and disclose personal information that you provide to us. By using our web site, you consent to the collection and use of your personal information by us. Opt-Out Option: If you would like to have your personally-identifiable information removed from Dotworkz’ databases going forward, please call 866.575.4689, or email info@dotworkz.com, and we will use reasonable efforts to comply with your request. However, there will be residual information that will remain within Dotworkz’ databases, access logs, and other historical internal records, which may or may not contain such personally-identifiable information. Non-personally-identifiable information:(a) General: When users come to our Site, we collect and aggregate information indicating their home server, but not their e-mail addresses. Such information helps us identify the most popular content and portions of our Site and determine the effectiveness of our various promotional activities. We aggregate such information for internal review and thereafter it’s superseded by more recent information. (b) “Cookies”: We also use “cookies” — that is, small text files placed on your computer’s hard drive — to help you in getting faster access to this Site’s contents, and to help us determine the type of content you find of interest and the sites to which you link, the length of time you spend at any particular area of this Site, and the particular Dotworkz services you choose to use. Cookies are only read by the server that placed them, and are unable to execute any code or virus. Cookies allow Dotworkz to serve you better, and to personalize your Web-browsing experience. Nevertheless, you should be able to control how and whether cookies will be accepted by your Web browser. For more information on how to do this, please refer to the documentation accompanying your browser or third party Web sites. Personally Identifiable Information:(a) General: In certain areas of this Site, we require that you provide us with personally-identifiable information, in order to be able to use that portion or those portions of this Site. For instance, the names and contact information of persons who visit our Web sites are added to our data base (presently maintained in San Diego, California, USA) so that, for example, they may be contacted in the future regarding Dotworkz’ products, services or future opportunities. Such contact may occur by email, telephone or mail, as Dotworkz deems appropriate. (b) Lack of Dotworkz Responsibility For Third Party Content On Site: Dotworkz cannot and does not control the acts of the users of its Web site’s services or monitor the accuracy of postings by such users. All users should be aware that, when they disclose personally identifiable information in a bulletin board, chat room, or other forum or public area of this Site, the information might be collected, circulated, and used by others. In the event that you encounter any user who is improperly collecting or using information about you or other users, please contact us at 866.575.4689, or email info@dotworkz.com. How We Use Non-Personally Identifiable Information: We aggregate data on users’ home servers for internal review purposes, in order to build higher quality, more useful online services and better products, e.g., by performing statistical analyses of the collective characteristics and behavior of our users. Following such internal review, such aggregated information is then superseded by more recent information. Dotworkz reserves the right to disclose information contained in our access logs concerning any user as we reasonably feel is necessary to protect our systems or business. In particular, we reserve the right to disclose such when a user is in violation of our current or later Terms of Service or other published guidelines, or initiates or participates in (or suspected of) any illegal activity, even without a subpoena, warrant, or other court order, and to disclose such information in response to court and governmental orders, civil subpoenas, discovery requests, and as otherwise required by law. In reviewing the information above, please keep in mind that Dotworkz cannot and does not assume any responsibility for any actions or omissions of third parties, including other Site users, including the manner in which they might use information received either from Dotworkz or independently. Upon receiving your order, please review your packing slip carefully to ensure that you have received your entire order. If you did not receive items on your packing slip or your package was damaged during shipping, please contact Dotworkz Customer Service immediately at info@dotworkz.com or call (866) 575-4689 for assistance. 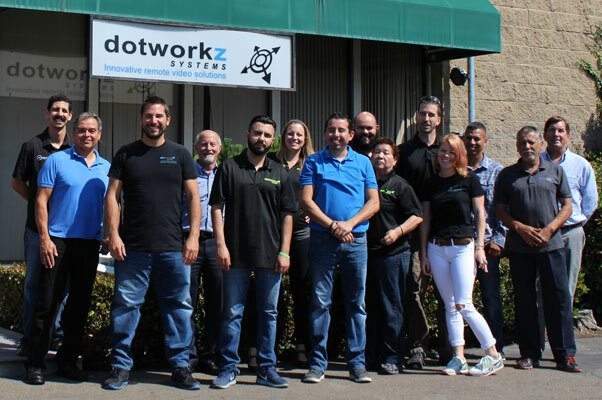 If Dotworkz Tech Support is needed or additional parts are required prior to requesting a RMA, please contact Jay Hilton (Product manager & Solution Engineer) at (619) 270-8409 or email him at jay.hilton@dotworkz.com. Restocking Fee: Please note there is will be a 20% restocking fee for all returns and exchanges. NOTE: Resellers/Distributors: All unsold Dotworkz products are not guaranteed eligibility for return and RMA are treated case by case. Please submit the following information to rma@dotworkz.com alias. In the subject header please title the email “RMA Request for (original PO#)”. Product model number If product does not have serial number please take a picture and attach to email. Product serial number located on the underside of the enclosure. Dotworkz will acknowledge receipt of the RMA request within 24-48 hours. Dotworkz will review the request and respond within 1-3 days of receipt of the RMA request. Dotworkz will send the RMA Confirmation to the person requesting the RMA. Dotworkz will provide a return label if necessary. All products being shipped back to Dotworkz Systems HAVE to include the RMA Number on the outside of the shipping package so it can be read easily. A copy of the RMA confirmation is to be included inside the box. Once the product is received at Dotworkz, a confirmation of shipment receipt will be sent to the contact person provided. Dotworkz will then review the failure, determine lead time/repair time and possible cost (not covered under warranty) and send a confirmation to contact person provided for estimated completion date to ship. The Product is to be in the original packaging and shipped securely. Packages that are not securely packaged may be damaged in transit. RMA number must be clearly visible. Dotworkz Systems is not responsible for any postage and handling charges. All shipping costs are non-refundable. NOTE: All made- to –order/ custom orders are non-returnable. Other non-returnable products include, but are not limited to; lenses, shields, solar kits, and custom NVRs. Please contact Dotworkz Support at Support@Dotworkz.com if you need further information. In the event that the product you are returning does NOT meet the requirements described in this document, we will photograph the merchandise and packaging, and prepare a detailed summary of our determination as to why the return was denied, the product(s) will be deemed not eligible for return and will be returned to you. Dotworkz Systems will not be responsible for any shipping or handling cost of those products. Dotworkz extends the following LIMITED WARRANTY to the original owner/purchaser of this product: One year from the date of initial sale for all Dotworkz products unless otherwise stated. Please note NVR servers and encoders carry warranties a one year warranty. 1. If this product, or any part or portion thereof, shall prove upon examination by DOTWORKZ, to be defective in material or workmanship, DOTWORKZ will repair or replace such part or portion at Dotworkz option. The warranty period on the repaired or replaced part or portion of this product shall be limited to the unexpired term of the original warranty. The buyer shall be responsible for all shipping and transportation of the product to DOTWORKZ for any performance under this warranty. a. Any accident to this product, any misuse or abuse, alternation, use in modified form, or any attempt to repair this product shall void this warranty. These conditions to the warranty include, but are not limited to, incorrect power connections, physical damage due to mechanical shock, chemical exposure, exposure to moisture, and circuit modification. b. SHOULD THIS PRODUCT PROVE DEFECTIVE FOLLOWING PURCHASE, THE BUYER, NOT THE MANUFACTURER, DISTRIBUTOR, OR RETAILER, ASSUMES THE ENTIRE COST OF ALL SERVICING OR REPAIR, EXCEPT AS OTHERWISE PROVIDED BY THE TERMS OF THIS WARRANTY. c. FOR BREACH OF ANY WRITTEN OR IMPLIED WARRANTY ON THIS PRODUCT, THE BUYER IS LIMITED TO THE FOLLOWING DAMAGES. (1) THE COST OF LABOR TO REPAIR OR REPLACE DEFECTIVE PARTS OR PORTIONS OF THIS PRODUCT, AND (2) THE COST OF THE REPAIRED OR REPLACE PARTS OR PORTIONS OF THIS PRODUCT. d. NO OTHER EXPRESSED OR IMPLIED WARRANTIES HAVE BEEN MADE OR WILL BE MADE ON BEHALF OF DOTWORKZ WITH RESPECT TO THE SALE, REPAIR, INSTALLATION, OPERATION, OR REPLACEMENT OR THIS PRODUCT. DOTWORKZ DISCLAIMS ANY IMPLIED WARRANTY OF MERCHANTABILITY OF THIS PRODUCT OR ITS FITNESS FOR ANY PURPOSE, AND THE BUYER AGREES THAT THIS PRODUCT IS SOLD “AS IS” AND THAT THE ENTIRE RISK OF QUALITY AND PERFORMANCE OF THIS PRODUCT IS WITH THE BUYER, EXCEPT AS OTHERWISE PROVIDED BY THE TERMS OF THIS WARRANTY. e. Some states/jurisdictions do not allow exclusions or limitations of incidental or consequential damages, or limitations on how long an implied warranty lasts, so the above exclusions or limitations may not apply to you. 3. If you do not wish to be bound by any of the provisions in this warranty, please return the product(s) immediately. 4. Contact your dealer regarding return authorization for out of warranty repairs and any further product information. 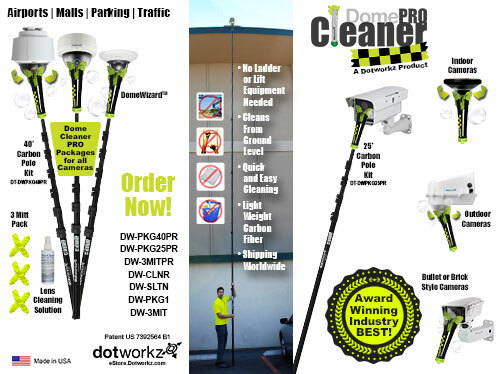 Dotworkz warrants housings, cables, mounts, cleaning tools, against any deemed defects that are due to workmanship for parts or faulty materials, except for exterior cosmetic blemishes, oxidation or scratches on protective lens, for a maximum of three years from the date of the original purchase when purchased directly from the official Dotworkz Estore. NVRs and recording products are excluded to 1 year for memory, motherboards, powering circuits, and case. This warranty does not cover damages, loss of revenue, loss of product, labor costs or data loss. Product damage resulting from unreasonable use or misuse, theft, vandalism, chemical exposure, lack of or improper maintenance is not covered. Mounting underwater will void the warranty. If any product does fail to operate under warranted specifications, send the product postage paid to: Dotworkz – 3688 Midway Dr, San Diego, CA 92110. Only the above manufacturer is authorized to perform warranty repair or replace product. Any consequential damages to person or property are excluded from this warranty. Some states do not allow the exclusion and limitation of incidental or consequential damages, therefore the above limitations or exclusions may not apply. This warranty gives you specific legal rights and you may also have other rights. Strobe lights and other light accessory kits are not covered by this 3 year warranty. Dotworkz warrants housings, cables, mounts, cleaning tools, against any deemed defects that are due to workmanship for parts or faulty materials, except for exterior cosmetic blemishes, oxidation or scratches on protective lens, for a maximum of one year from the date of the original purchase. NVRs and recording products are warrantied for 1 year for memory, motherboards, powering circuits, and case. This warranty does not cover damages, loss of revenue, loss of product, labor costs or data loss. Product damage resulting from unreasonable use or misuse, theft, vandalism, chemical exposure, lack of or improper maintenance is not covered. Mounting underwater will void the warranty. If any product does fail to operate under warranted specifications, send the product postage paid to: Dotworkz – 3688 Midway Dr, San Diego, CA 92110. Return ground shipping prepaid in US only. Only the above manufacturer is authorized to perform warranty repair or replace product. Any consequential damages to person or property are excluded from this warranty. Some states do not allow the exclusion and limitation of incidental or consequential damages, therefore the above limitations or exclusions may not apply. This warranty gives you specific legal rights and you may also have other rights. Strobe lights and other light accessory kits are not covered by this 1 year warranty. 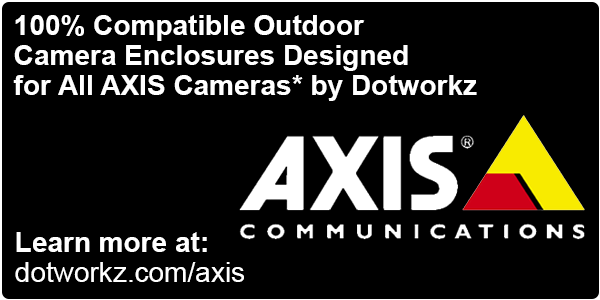 All Dotworkz Outdoor Housings have been engineered to provide an installation friendly array of product options for security cameras, recording hardware, wireless radios, power sources and other sensitive at risk communication hardware. All our outdoor products include the Dotworkz signature design of vandal proof thermoplastics, insulation layering, and active internal climate controls. When combined with a leading security or action camera brand you get the most secure, incredibly long lasting, and the most reliable outdoor camera system for professional results in every environment. 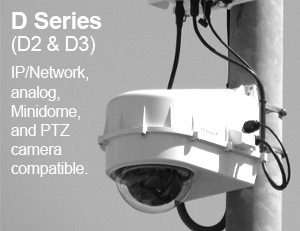 A Dotworkz Housing offers the ultimate protection of your Security Camera and Security Camera Equipment. 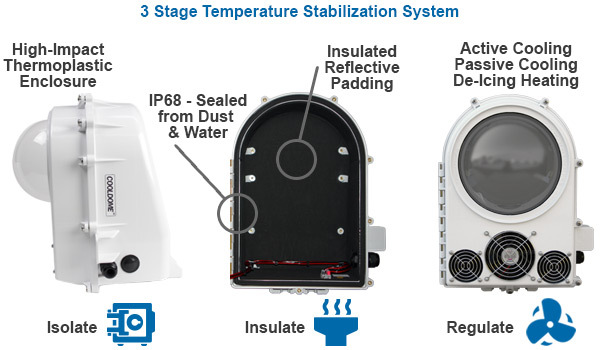 Our unique 3 Stage Temperature Stabilization System Isolates (providing a sealed barrier rated at IP68 for D Series and IP66 for S-Type ), Insulates (the enclosure is polycarbonate thermal plastic which virtually eliminates heat transfer and the optional 2 part reflective padding further slow heat transfer), and Regulates (utilizing passive cooling, active cooling, or active heating depending on application), offering the ultimate temperature and environment protection system on the market. 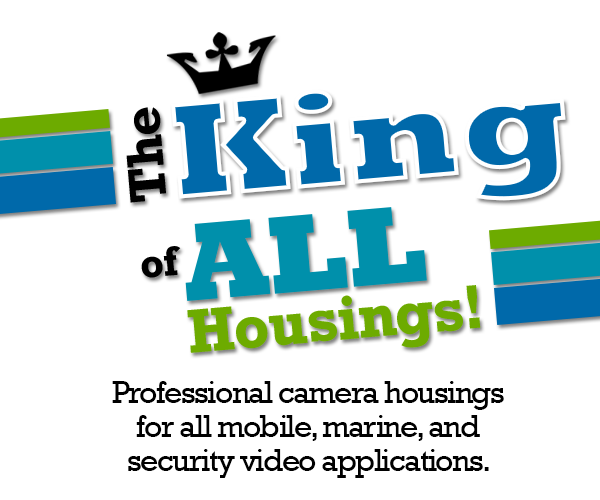 Why use professional grade housings for outdoor cameras. A Dotworkz Housing gives your Security Camera and Security Camera Equipment IP68 (D Series) and IP66 (S-Type) protection against dust and water, IK10++ (Anti-Theft and Vandal Protection), a compact design that fits all your equipment in one enclosure, all while offering a complete list of compatible electronics including all Axis, Sony, Samsung, Canon, ACTi, and Panasonic security cameras and Ubiquiti wireless antennas. 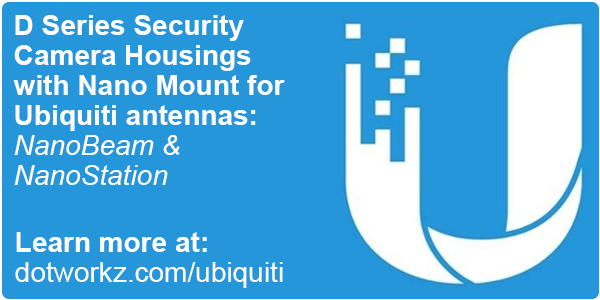 Our housings keep your equipment up and running with our 3 Stage Temperature Stabilization System allowing your equipment to operate at its optimal temperature range providing the ultimate outdoor video surveillance protection system. 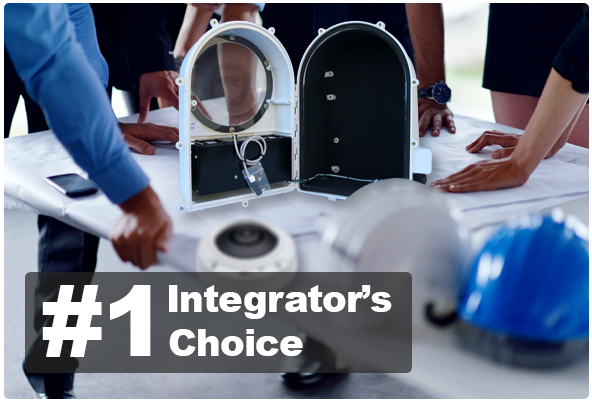 Integrator’s First Choice – Recognized for the D2 Security Camera Housing. 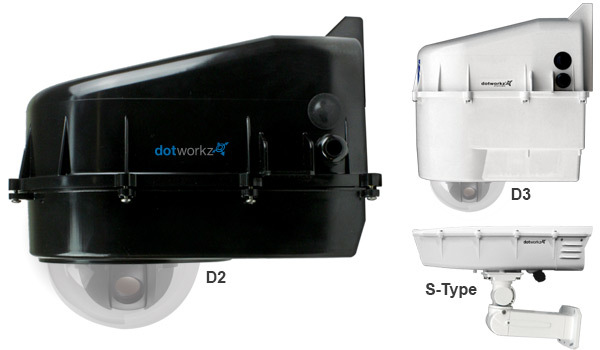 Dotworkz Offers a Complete Series of Climate Options – Cooling, Deicing, Dehumidifying, Wireless, and Solar Ready. No cabinets, No Nema Boxes, and No Expensive Proprietary Cables Required. 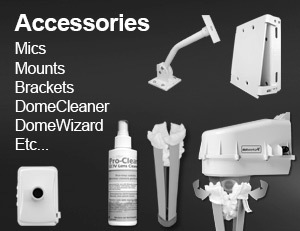 A One Stop Package That Saves Time, Money, is Compact, and Looks Great Installed. 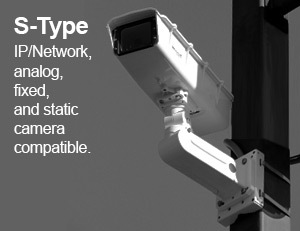 Turns an IP Camera into a Complete Outdoor Security System – Powering Options, Expandable Space for Critical Networking Hardware such as Switches, Wireless, LTE, NVR’s, and Unparalleled Protection. OEM/ODM Approved – Get your Specialty Camera to Market with American made Engineering and Production. Protection from mild to extremely hot climates and desert locations. Up to 167° F / 75° C temperatures. Protection from mild cold to extreme arctic and icy climates. Rated for temperatures down to -60° F / -51° C. 65 watts of De-Icing power. Protection from mild to extreme humid and wet climates – rust and oxidation protection. IP66 and IP68 Outdoor Solutions. Solar, Wireless, and Remote Location solutions. Ideal for remote locations & low wattage applications. We strive to be the leading experts in outdoor video protection solutions. Our reputation for customer service is unmatched – we’re not satisfied until you are. Our products are rigorously tested, UL and CE certified, for safety providing the ultimate protection against extreme environment conditions. Visit our trusted partner over at HDrelay.com. They are the experts at LIVE HD streaming (1080p), time lapse, rewind, and the all new fast forward playback.